Showing results for "Wahl blades"
Wahl 21 3 Hole Blade by Wahl Product Overview Details: Shipping Information: View shipping rates and policies Quality Products Have peace of mind knowing that your order will arrive original factory sealed packaging. That means that you'll have the full force of the manufacturer's warranty to protect your purchase. Fast and Free Shipping You're already purchasing the item. Why pay additional for shipping, especially slow shipping? We get your order shipped out and delivered to your doorstep as quickly as possible. Commitment We are committed to making sure that you leave this transaction satisfied. That means having access to real people that get your questions and concerns answered quickly. Give us a shot and we will make sure that you will look to us again! WAHL Black Peanut/bullet Snap-on Standard Blade, Black, From Wahl Professional's commercial grade line of products, the Peanut Snap On Clipper/Trimmer Blade (Black) is intended for professional use only and is designed to deliver the sharp performance that experts demand. This standard replacement blade is designed to fit the Wahl Professional Peanut Clipper/Trimmer #8655-200, Black. 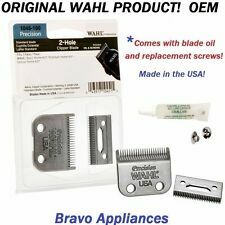 Package contains (1) Wahl Professional Peanut Snap On Clipper/Trimmer Blade (Black) #2068-300. Blades Made in USA. 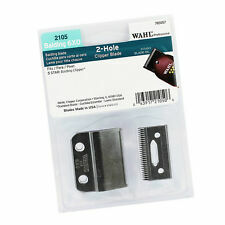 WAHL Professional 2 Hole Precision Clipper Blade Model:1045 NEW! WAHL Clipper blade Manufacturer Part #:1045 UPC: 043917104508 DESCRIPTION: • Fits models 9100, 9200, 9400, 9600, 9700, 8640-500, 8645-500, 8643-500, M/C, S/C. • Fits models Basic Home Kit, Multi-Cut Home Kit, Premium Home Kit, Deluxe Home Kit. • BONUS: Includes clipper blade oil and screws. PROFESSIONAL PRECISION: From Wahl Professional's commercial grade line of products, the Precision 2 Hold Clipper Blade is intended for professional use only and is designed to deliver the sharp performance that experts demand. PRODUCT SPECIFICATIONS: Package contains (1) Wahl Professional Precision 2 Hold Clipper Blade 1045 100. Silver in color. Includes blade oil and instructions. Blades made in the U.S.A.
Wahl 1045 Blade Set (Clipper & Trimmer Parts) Fits models 9100, 9200, 9400, 9600, 9700, 8640-500, 8645-500, 8643-500, M/C, S/C. Fits models Basic Home Kit, Multi-Cut Home Kit, Premium Home Kit, Deluxe Home Kit. Wahl high quality blade set. Wahl high quality inch case. Energy star certified. 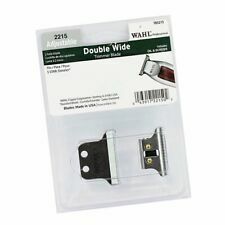 Wahl 1045 Blade Set Product Features Fits models 9100, 9200, 9400, 9600, 9700, 8640-500, 8645-500, 8643-500, M/C, S/C. Fits models Basic Home Kit, Multi-Cut Home Kit, Premium Home Kit, Deluxe Home Kit. Product Description Wahl high quality blade set. Wahl high quality inch case. Energy star certified.